Service to others – Service stands as a hallmark of who SOYO has become. The Good Samaritan Project is an opportunity for teens to highlight their outreach work to the parish and their fellow teens, so as to encourage others to join in their efforts to minister to those in need. 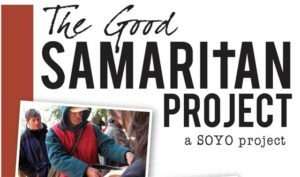 Check out the link above for an helpful information to start Good Samaritan Project in your area! Youth Equipped to Serve (Y.E.S.) formerly OYO – Orthodox Youth Outreach was designed to create opportunities for teens to serve those in need in the shelters and on the streets across the United States and Canada.